This pattern is an oldie but a goodie – the Deer and Doe Plaintain T-Shirt. The Plantain is a scoop necked tee with a flared hem and as with all D+D patterns seems to treat my FBA-needing lady cargo pretty well. The size range of the Plantain has increased and now runs from a 34 to a 52. And did I mention this sucker is a freebie? That is my kind of price tag! The fabric is a lightweight merino jersey in the ivory colourway from The Fabric Store. I snaffled this in Melbourne but you can find it in any of their stores and online. I’ve used this before for making a tee and it lasted really well. I was always hesitant to wear a merino t-shirt because for some reason I thought I’d overheat but the rad Rachel changed my mind on this a few years back and I’m glad I listened. I wore this top repeatedly on holiday in Vanuatu and it lasted well in the warmth and humidity. This lady stayed as fresh as a sassy daisy! The construction of this sucker was super easy. There is only a few pieces and the instructions are clear and easy to follow. The exciting news is that I played around on my coverstitch with this one and had fun with a fancy hem. Do I need that extra line of stitching? Heck no! But it makes me feel fancy and isn’t that what creating your own clothes is all about? That sweet scoop neck. This is the main reason I keep making this tee – the scoop is just perfect. It is a quick win. With my sewing mojo completely shot something like that practical and quick to make is a good confidence booster. Find out what the go is with those drag lines near the armholes. It’s time to don my deerstalker hat! Potentially shorten the hem by a couple of centimetres if I want to wear it untucked. I like my shirts to hit my hip bones and no longer. Geez I’m fussy! Fabric: 1m of ivory merino jersey from The Fabric Store in Melbourne. Overall, I love the Plantain t-shirt and I have been wearing the heck out of this one. I even made another one up in a tissue weight jersey I got from Mood a ways back. While I love that top it is waaaaay too transparent to wear out of the house so just imagine a super rad and floaty eggplant coloured version of the above… Nice work! You imagined it perfectly! Now to see if I can coax my sewing mojo to make something else that is not a t-shirt… I believe there is some Liberty silk calling my name! Love your Tee! I was curious to know what you meant by “seems to treat my FBA-needing lady cargo pretty well” – does that mean you don’t have to do an FBA with this pattern?! which would be AMAZING to know since I always have to 🙂 I JUST had this Plantain printed at the copyshop a few days ago (I downloaded at least a year ago) and I’m excited to try the pattern which is why I was curious about your FBA 🙂 Your Plantain has really inspired me to get that pattern taped up asap! Hi Kathleen, I didn’t FBA this pattern and the fit is good! Good luck with it – this is such a fun and easy top to sew up! I too love this pattern. Interesting re merino in warm weather, I’d never had thunk it! Also I wonder if using fabric with a little Lycra in it would help with those drag lines? The merino was so dang good in Vanuatu! I have fully converted! Apparently the current version of the Plantain has been redrafted around the arms to help combat the drag lines (my version is from a number of years back). I’m going to make one of the new ones up and report back! Always great Fabric from The Fabric Store. Love to read a fellow Aussie. Love the look of this– that merino is perfect. 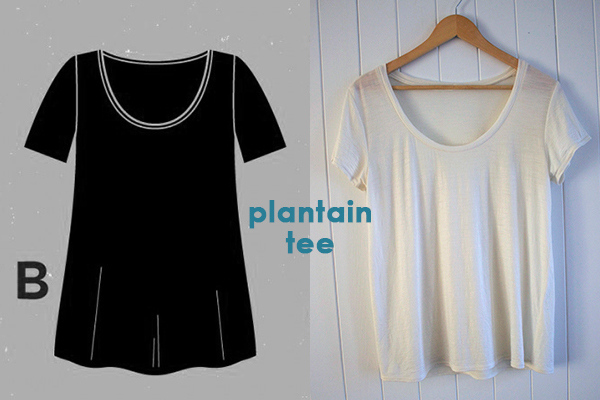 I was just looking for a t-shirt pattern and have had the plantain printed out sitting in my stash for YEARS! Also the fact that you didn’t have to do a FBA is awesome. Was it easy to finish the neckline using your coverstitch machine? Very nice! I’ve always been hesitant to make my own t-shirts. I’ve had success in the past, but there is something about them that just does not scream “sew me!” However, if I had some of your lovely fabric, I may be tempted to try again – off to hunt some down! You had me at Adventure Zone! I’m not all caught up but winter is aiding me in churning through the last few. All I want to do is sit on the couch and listen to my boys. I love the shirt. The scoop on that IS perfect! I have been contemplating some merino shirts also, maybe this will push me into giving it a go! The merino is totally worth it for tees. I have ordered some more to make a few more tops. This lady is never going back! ack! All of this!! I listened to today’s Love to Sew podcast, and immediately came to check out your blog. Casually scrolling…and then AN ADVENTURE ZONE REFERENCE?!? My husband and I are both big gaming nerds. We have our respective crafts (woodworking and sewing) set up together in our back bedroom and will listen to TAZ and other actual play podcasts while we work. I’m a listen rather than watch DnD nerd myself. I follow Acq Inc, C Team, and Dice Camera Action for the most part. Dragons and Places are our on our co-listen list, but we haven’t had time to do so together to check it out. I can’t remember if I have tried out Critical Role – i’ll add it to my list! Lovely t-shirt that looks perfect on you. I like the idea of not having to do a FBA, and have just downloaded the Plantain pattern. Interesting to hear that the merino jersey is good in summer – I will have to try it. Lucky you having a cover stitch machine – which model do you have? My coverstitch is a Janome CoverPro 2000CPX. I seriously love this machine for the fierce hems!